I am an avowed Red Velvet Snob. I have tried more than 45+ different recipes for it -yes there are that many! After that many recipes, I am sticking w/ my family heirloom recipe. I once made the mistake of sharing this beloved recipe on the cake central website, and while it got rave reviews, there were also amateurs who would frost this beautiful cake with ungodly cream cheese crap stuff; people who believed it had too much red dye, then there were those kitchen experiments gone wrong (ie., using dry chocolate pudding in place of cocoa...what were they thinking?!) and the list goes on. So I removed my recipe...and the uproar it caused! So another member lovingly re-posted my family recipe tweaking it from 2 bottles of red food dye to 1 bottle. GRRRR! Yes I growled. If you want to use my family recipe don't screw it up...don't tweak it...don't use the wrong frosting. In short, please find another recipe to massacre. of a Devil's Food Cake, but is a vibrant red colour. Some recipes call for the use of vinegar and buttermilk, psst the vinegar is NOT needed. If you have a recipe with buttermilk, the acidity in the buttermilk lends enough acidity to allow the baking soda to go to work. I'm fortunate enough to come from a line of phenomenal cooks and bakers. These ladies KNOW how to make a red velvet cake, and warning! One mention of cream cheese frosting they will turn up their nose. As Granna puts it "they're messing it up if they don't use the original frosting!" Granna actually has a yellowed clipping of what is the first published recipe for red velvet cake and it does NOT call for cream cheese frosting!! We use the frosting from this published recipe, but the cake recipe is our family's. The frosting, like the cake, is truly unique! It envolves many cooking techniques, but don't let that scare you away! Well what about the frosting? Mmmm it's buttery, has a slight vanilla taste, and is a light whipped texture. Paired with red velvet cake it's a class act! First the icing starts off by being cooked -basically making a roux (which is DEFINATELY a southern term) and then it moves to a stage where the roux cools to room temperature. Meanwhile, you have other ingredients which are being creamed together. Then you have the culmination where the roux mixture meets the creamed mixture to become a whipped mixture which although it is whipped, it is not as airy or delicate like a "whipped cream" would be, and yet it's not as heavy or dense as a buttercream or a cream cheese frosting. 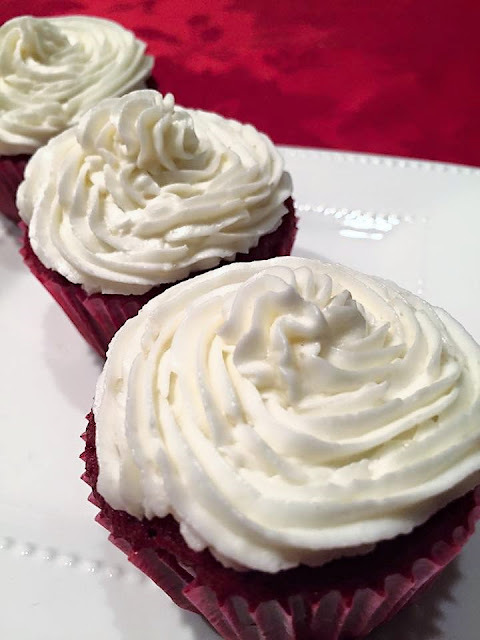 The texture -if the icing is made properly- is delicate in feel, literally like a soft buttercream, but not overly sweet - the icing does have sugar in it, but it is granulated. 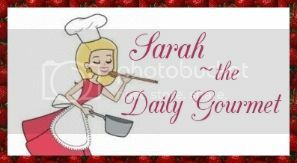 If I have any particuliar question about the recipe it is simply "is this granulated or confectioner sugar" which I can understand, and most people will think it will come out grainy. Well if you make it properly the granules will dissolve and you'll be left w/ an icing that has a slight hint of a buttery vanilla flavour. Okay, okay so what about the recipe? Ladies and Gentlemen I present Sarah's ravishing red velvet cake (Accept no impostors!) Yes, you will see this same cake (titled: Sarah's red velvet cake tweaked) on cake central, but this is my family recipe.  Preheat oven to 350° F.
 Sift flour, cocoa, salt, and baking soda together and set aside.  Place butter and sugar in bowl of electric mixer and beat at medium-speed until light and fluffy, about 5 minutes. Beat in eggs, one at a time. With mixer on low, add red food coloring (be careful not to splash it!). Add vanilla. Add buttermilk alternately with flour mixture - begin and end with the buttermilk! Scrape the bowl as needed after each addition.  Pour batter into prepared pans and bake for 28 – 35 minutes or until toothpick inserted into the center comes out clean. Cool in pan for 10 minutes and then gently turn cakes out onto cooling rack to cool to room temperature.  Frost with the authentic frosting. 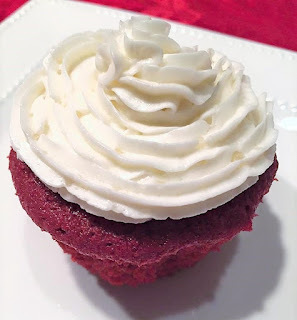 Often called "Mary Kay frosting" (we don't know how this name stuck) or some know it as a poor man's frosting - this is the original frosting for red velvet cake!  In a saucepan, add the flour and 1/4 cup of milk and whisk until smooth. Add the remaining milk and whisk until well combined. Cook over medium heat until mixture is thickened. Cool completely. I have NOT tried this with all butter, I won't be offended with this small change, but please NO CREAM CHEESE!!!! Do you use salted or unsalted butter for the cake and the frosting? It's a personal preference where I use unsalted butter in the cake, and salted butter in the frosting, I've also used salted butter in both.